Rejection, punishment, and put-downs – these are the ways we condemn both others and ourselves. 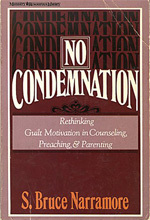 How can we get free from self-condemnation and our condemnation of others? This biblically accurate and wisely practical book points the way. Narramore offers a perspective seldom seen. As a practicing psychologist who is also a serious theologian, he carefully compares biblical and psychological views of guilt, shame, and condemnation. He takes Romans 8:1 seriously: there is no condemnation for those who are in Christ Jesus. Part I unmasks the hidden guilt operating in our lives and explains the relationship between guilt and anxiety. Part III first distinguishes between actual guilt and simply “feeling guilty.” It reveals how we use guilt feelings to punish ourselves, and describes godly sorrow as the only proper response to our failings. Part IV looks at the role of conscience and explains how it can lead us astray. Part V acquaints us with “Psychotherapy, Guilt, and Grace.” It is followed by an excellent appendix which focuses on moving beyond condemnation in preaching and parenting. I regularly train both pastors and “regular people” in the art of coming alongside others who are experiencing distress, and I always have them read this book. Always. I do so for three reasons. First, because it corrects our culture’s ignorance of the pervasive influence of guilt. Second because it counters the common tendency of counselors (secular and Christian) to overlook the many ways guilt contributes to psychological maladjustment. And third, because unless we learn to recognize the role of guilt in people’s lives, we won’t be either personally free or inter-personally effective. In our relationship with our Lord we find no rejection, no punishment, and no put-downs. He never encourages self-condemnation. Narramore’s book clearly presents this truth. Consider it a must read. Thanks for introducing this book to us, Lynne. It really helped us clarify how we wanted to discipline our kids — without condemnation. Definitely deserves a re-reading!